After a long season most athletes step back from structured training and relax. On the other hand, this is also the period when most coaches are working overtime. You and/or your coach is going back over the season’s worth of data, analyzing your best and worst performances, and determining what did and did not work. You can use this information to prepare for the coming year to make next season better than ever! This is where the Annual Training Plan (ATP) comes into play. The ATP is used as a macro-planning tool to allow a coach the ability to map out the entire season given your targeted peak events. There are many reasons why a coach or self-coached athlete would want to create an ATP for the coming season. This tool allows you to look at the year as a whole and ensure adequate builds for each peak event (both base and intensity phases). In doing so, you and your coach can then reference the ATP throughout the season to ensure you are kept on track from the original program. This will prevent you from shortening/missing crucial training blocks, or peaking too early, by ensuring properly planned periodization. Typically, the Annual Training Plan for the next year is created immediately following the conclusion of the current one. Done by yourself or with your coach, a season review is done to discuss the year’s biggest accomplishments, what worked and what didn’t, and map out goals for the coming season. This should be done before you have too much time to rest, while the memories and ‘hunger’ are still strong. Once the target events are determined, you can get to work building the program for next year. The first step in creating your ATP is to input the peak events. In doing so, you will prioritize each race on an A to C scale, and visualize how much time is allowed between races. 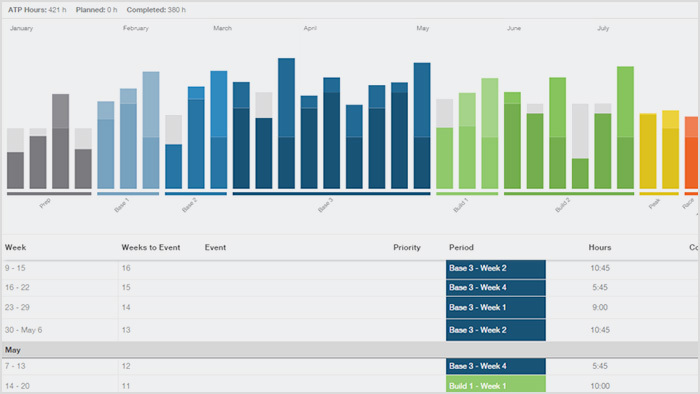 Simply take the events given by the athlete to be targeted and organize by date and priority. Next is to determine the total number of training hours to be completed. To do so, look back at what was completed this year and ask a few questions. Should you increase the hours? Do you have the time available to increase your training duration? Do your goals require an increase in training volume? Answering these questions will guide you to select an appropriate amount of annual training hours. No increase, or a decrease, may mean poor performances or a plateau. However, too big of a leap may lead to overtraining or burnout. Once the peak events and hours are allocated, one must input the weekly periods and recovery cycles. This is where you plot out each build phase, type and length, and calculate when and what intensity is required for optimal performance. Of course, you must spend extra time addressing weaknesses found in the previous season, as well as particular power needs for the peak events. This will guide you in determining what build phases to complete and when. Depending on the type and length of efforts you are completing in, you may opt for 3 or 4 (or another variable altogether) week cycle before recovery is allowed. Per traditional training methodology, you must stress the system to force adaptation – but not so great of a stress that one is unable to recover in a reasonable length of time. After a long season, athletes certainly deserve some time to step away from their athletic endeavors, spend time with their family, get caught up on things around the house or work or to simply unwind. Meanwhile, a good coach will be working overtime behind the scenes to map out the coming season and program for the athlete to build upon the successes of the previous year. An Annual Training Plan not only helps one plan out the season as a whole, it similarly acts to keep the coach honest with their month to month (or weekly) planning and not get off track. It also serves an additional benefit to the athlete in the form of motivation– motivation to complete today’s workout because it will build to next week, next month, etc. By creating your ATP and seeing what’s coming next, you can see the big picture vision for your goals and successes. Watch this short video to learn more about how to create your ATP. With over a decade of racing experience and 8 years of coaching experience, Tucker brings a wealth of practical knowledge to the table. He has raced across the country, as well as in Europe, competing at the highest level as an amateur, which resulted in numerous state championships and several national championship podium appearances. Tucker owns'Ultreya Coaching'in Boulder, Colorado and holds a BS in Health and Exercise Sciences with a concentration in Sports Medicine from Colorado State University. Whether it's aiming for a local criterium or an international stage race, Tucker has the experience necessary to help anyone accomplish his or her goals!